Another photograph from Port Renfrew from a couple of years ago. This church is a traveller and a bit lost now, I think. Probably it is looking for its cemetery, which can be found here. It was originally built in 1874 at Somenos on the other side of Vancouver Island then suffered a bad fire and was rebuilt in 1909. The church abandoned its cemetery to a lonely existence when it moved to Port Renfrew in 1970. In its new home it became a joint operation of the Anglican, Roman Catholic, Presbyterian and United Ministries. I don’t suppose it sees a lot of use these days, but it will be jumping in a couple of weeks as one of the venues for the Song and Surf Music Festival. 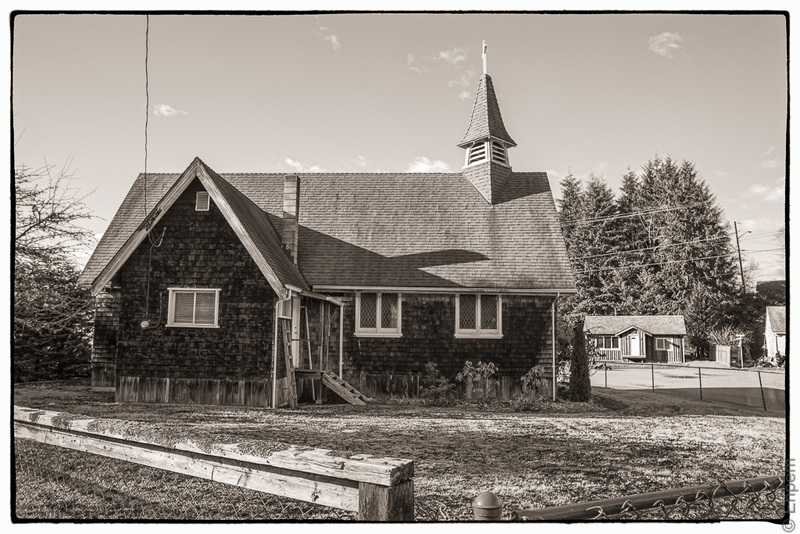 To see other Port Renfrew photos, click here and for another longer view of the church, here. Canon 5Dii, Nikkor-N Auto 24/f2.8 lens, ISO400, 1/320th.